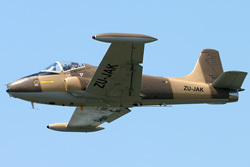 The Strikemaster, unlike its Jet Provost cousin was not employed very frequently by display teams during its military career. Most of its display work began when the aeroplanes entered private ownership, please see below for further details. 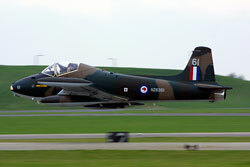 If you have any information and/or images of Strikemaster display teams that existed, and would like to see them listed on this site please get in touch. 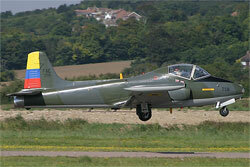 The first Strikemaster team in the UK was formed in 1998 by Tom Moloney and Bob Thompson. 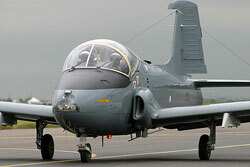 Under the sponsorship of Transair, the two pilots operated a Strikemaster duo, which replaced the Jet Provost team that was operated on the airshow circuit for the two previous seasons. 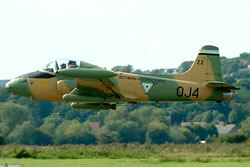 The airframes used were both ex-Kenyan Mk.87s that later saw service with the Botswana Defence Force. The first was Mk.83 OJ4 G-UNNY that was flown in basic camouflage without insignia, and Mk.87 OJ5 G-BXFP, which was re-finished to represent a Royal New Zealand Air Force aeroplane, NZ6361. The team flew at several displays, including appearances at Kemble, Yeovilton and Shoreham before the two pilots decided to disband at the end of the season. In August 2000, the team reformed briefly for an appearance at Kemble but this was to be Tom and Bob's final display together. 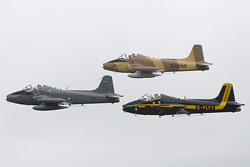 This display team trio debuted at Kemble Air Day 2007, and consisted of privately owned Strikemaster aeroplanes all maintained by North Wales Military Aviation Services (NWMAS) at Hawarden. A tight formation non-aerobatics sequence was flown at the event by Mark Petrie in Mk.82A G-SOAF, John Rowley flying Mk.80A G-FLYY and George Begg in his personal aeroplane G-UVNR, an ex-Kenyan/Botswana airframe. These airframes had prior to this display, and following it, been regular visitors to airshows in the static areas; being seen at various airshow venues ranging from Yeovilton in the south, to Leuchars in the North of the UK. 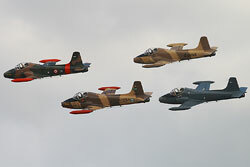 During the winter of 2008, Gerald Williams began to develop an idea to create a 4-ship Strikemaster display team. However, for this venture to work he had to find a pool of willing display pilots. Chris Heames, Justin Hughes and Mark Petrie were quickly established as members of the line-up, alongside vastly experienced RAF pilots Dan Arlett and Matt Masters. A group of aeroplanes would also would be required; Strikemaster G-UPPI based at Exeter was immediately put forward, alongside Mk.82A G-SOAF and Mk.87 G-UVNR which were both housed with Mark Petrie's NWMAS facility at Hawarden. A further two privately owned aeroplanes, ex-Saudi Mk.80A 1130 G-CDHB (later re-registered G-VPER) and ex-Singapore Defence Force Mk.84 311 G-MXPH were added to the display fleet. Unfortunately, G-UPPI suffered damage following a forced landing in March 2009, which robbed the team of the designated spare airframe. Following a thorough weekend work-up at RAF Lyneham in April 2009, the team made its debut at Galway in May, and went on to display at venues such as Biggin Hill, Waddington, Whitehaven, Leuchars and Volkel in the Netherlands. 2009 was regarded as very much a learning curve as a season, with the 2010 display set to be far slicker and more dynamic. The team kick off its 2010 calendar with a 3-week tour to the Middle East, including displays at Bahrain and Al Ain. 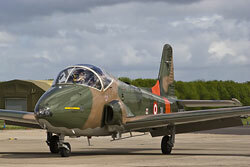 Following the demise of the Strikemaster duo, Tom Moloney moved his aeroplane (G-UNNY) to Duxford where it was maintained by the Aircraft Restoration Company and operated as a solo performer on the display circuit. 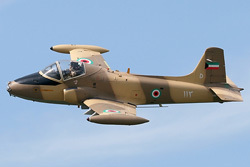 A small yet agile aeroplane, it proved a very popular act and was booked for numerous shows between 1999 and 2003, when G-UNNY was retired and replaced by Tom's new mount, an ex-Royal Saudi Arabia Air Force Mk.80A Strikemaster. This aeroplane had been restored at Duxford, and was originally registered as G-CBPB, before taking up the more-unusual registration G-UPPI. 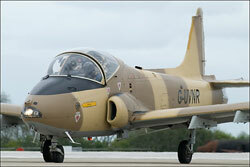 Refinished in Ecuadorian Air Force colours as FAE259 and debuting at Kemble Air Day in June 2003, Tom continued to display until he announced his retirement from the airshow circuit at the end of the season. Throughout the proceeding five years, Tom acquired and subsequently sold on two further Strikemasters before acquiring his fifth overall aeroplane in February 2008. Registered G-CFBK, the aeroplane was moved to North Weald for a thorough restoration and flew for the first time in May 2009, resplendent in Kuwaiti Air Force markings. During the subsequent season Tom appeared at several display venues, including Kemble, Shoreham and Rougham. 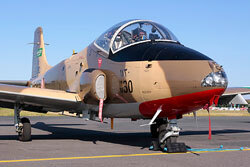 In 1998, Ralph Garlick acquired Strikemaster Mk.83 OJ6 and registered it G-BXFR for its ferry flight to its new home at Cape Town, South African. Flown to its new home by Ralph and prominent UK warbird pilot Mark Linney later that year, the aeroplane was registered ZU-PER and was housed with the Thunder City collection. It was refinished in overall black paint, the house colours of Thunder City and has been present on the airshow circuit ever since. Gerald Williams began to make his mark on the UK airshow circuit in 2003, making his display debut at Kemble in his Jet Provost Mk.5A G-JPTV. The following year, he acquired Tom Moloney's aeroplane G-UPPI and following dismantlement by NWMAS (North Wales Military Aviation Services) engineers at Hawarden, it was shipped by sea to Cape Town, arriving in November 2005. Registered ZU-JAK, the aeroplane was completely rebuilt by the Aviation Business Centre, and on completion of the project was completely re-finished into a desert camouflage. 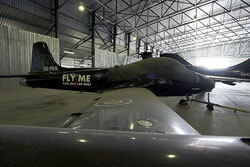 It was test-flown on 6th June 2006, and had arrived at its new home in Durban by the end of that month where it began a busy period on the display circuit. In 2008, Gerald returned to the UK and G-UPPI was shipped back and sold to a new owner based in the UK.